Science and engineering (S&E) includes biological/agricultural sciences, physical sciences, computer sciences, mathematics/statistics, engineering, psychology, and social sciences; excludes health sciences. Physical sciences = chemistry, physics, astronomy, and earth/atmospheric/ocean sciences. In 2011, nearly 550,000 bachelor’s degrees in S&E fields were awarded in the United States, a 39% increase since 2001. During this period, the number of S&E bachelor’s degrees conferred per 1,000 individuals 18–24 years old in the U.S. population increased by nearly 25%. There was wide variation among the states, however, both in total output of S&E bachelor’s degrees and in the output per 1,000 college-age residents. In 2011, 17.7 S&E bachelor’s degrees were conferred nationwide per 1,000 18–24 year-old residents, up from 14.2 degrees per 1,000 in 2001. The number of S&E bachelor’s degrees per 1,000 college-age residents rose in all states/jurisdictions except in the District of Columbia (a decrease from 53.5 degrees in 2001 to 46.9 degrees in 2011) and in Kansas (a very slight decrease from 15.6 to 15.5 degrees). Output among the 50 states in 2011 ranged from 9.0 S&E bachelor’s degrees per 1,000 college-age residents in Alaska to 39.4 degrees in Vermont. The District of Columbia had the highest ratio of S&E bachelor’s degrees (46.9) to 1,000 college-age residents. 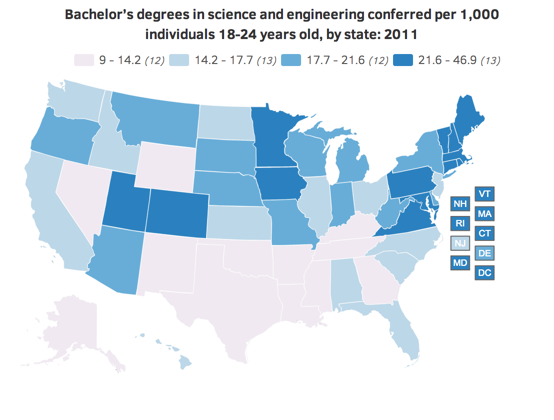 In terms of total output, California, New York, Texas, Pennsylvania, Florida, Illinois, and Massachusetts were the leading producers of S&E bachelor’s degrees in 2011. Their total number of degrees ranged from 68,228 in California to 20,023 in Massachusetts. When adjusted for population size (degrees per 1,000 residents of college age), the largest concentrations of S&E bachelor’s degrees appear in the northeastern states, the District of Columbia, and its surrounding states – Maryland, Virginia, and West Virginia. However, Iowa had the third highest ratio (37.8 degrees per 1,000 college-age residents) following the District of Columbia and Vermont, and seven other states located in the midwest and west conferred at least 20–24 degrees per 1,000 residents – Utah (24.1), Colorado (22.4), Minnesota (21.8), Arizona (21.5), Wisconsin (20.9), South Dakota (20.2), and Oregon (20.0).